Could your bathroom vanity use an upgrade? The best bathroom vanities are able to provide your room with a stunning look that compliments all of your fixtures and style. The modern bathroom vanity does more than just serve as a receptacle for your sink. It is a place of storage for your needed items while providing your home with added warmth thanks to tones of wood, marble, and glass that are often included. Are you ready to explore what bathroom vanity could provide your home with an amazing upgrade? The best bathroom vanity make come in several different styles. There may also be add-ons with your purchase that other vanities just don’t provide. To help with the selection process, we’ve developed the chart below to help you get started! How Do You Find the Best Bathroom Vanity? The first consideration during the shopping process that must be made is parts. Some bathroom vanities contain just the cabinet that supports the sink. You’ll be able to slip it into your bathroom with ease, but you’ll need to bring the new connectors, seals, and sink support mechanisms that will help your vanity stand up to the moisture a bathroom has. Another thing to think about with your new bathroom vanity is whether it will have a back or not. The best bathroom vanities are a full cabinet, but many of them have an open back for you to affix it to your wall. What happens if moisture gets into your drywall in-between the cupboard portion of the vanity and the floor? You’ll end up having to remove the entire vanity! If at all possible, consider a vanity with a back to safe yourself a headache. As for the counter of the vanity, you’ve got three basic options: particle board, granite, and marble. Many of the vanities you’ll find in stores today have a covered particle board counter because it’s cheaper. The only problem is that cheap won’t last very long! Granite is better, but marble is the best! Look to make sure whatever stone you get is sealed and polished so you can install the vanity right away. If you want the best bathroom vanity, then you’ll first want to look for a solid wood cabinet that has pre-cut places for installation. For most bathrooms, you’ll need to route the plumbing through the bottom or back of the vanity. By looking for a solid assembly, you’ll risk less damage during the shipping and installation process. The best bathroom vanity will also give you some storage options above and beyond what you already have. If you are getting drawers and cabinets in your vanity, then make sure the rails and hinges that have been installed are stainless steel or coated brass so that they can resist corrosion with the high moisture content of the bathroom. If you decide on a more affordable model that isn’t solid wood, you’ll want to double-check the veneers that are being used. One chip can quickly degrade the quality of the vanity and leave you with an ugly piece of furniture that supports your sink and nothing more. The best bathroom vanity tops will do more than just conceal the trap for your sink. They’re also going to provide you with adequate sink space and even provide you with some limited storage or counter space as well. When installed correctly, a vanity should be able to fully support all of your bathroom activities. The best bathroom vanity will do more than just provide you with more space. They’ll also help you eliminate the clutter that can develop in a bathroom. You can store your extra toilet paper or bathroom appliances and clean up the visual look of your room. Space is a premium item in your bathroom, however, which is why reading our bathroom vanity reviews is so critical. If you select the wrong vanity, you could end up with a major headache! If you’re shopping for an all-in-one bathroom vanity that includes the sink and faucet, then there’s a good chance that the sink basin will be made from toughened glass instead of porcelain. Toughened glass is a wonderful product that is incredibly durable and it makes for a good safety glass, but that also creates a potential problem. With the right contact, the sink can shatter into millions of tiny chunks! Many bathroom vanities also need to be customized in some way for a true installation to occur. Be prepared to have a plumber helping you move plumbing or grab your tools to make sure you get the vanity flush with the wall. If you leave gaps, then you’re giving mold, mildew, and other common bathroom growths the chance to have a new home! Are you looking for the best prices on bathroom vanities? You could shop for a cheap bathroom vanity at your local hardware store or big box retailer and find one for less than $200. It would be unfinished and you’ll likely have an open back. 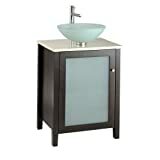 If you shop on Amazon, you can get an upgraded bathroom vanity for around $300 that includes a stone counter and real wood, not pressed wood or fiberboard, in the construction of it. These will include the sink and faucet as well, something the cheap unfinished vanities don’t provide. If you’re willing to invest a little more, the best bathroom vanities that are available right now typically retail for $400-$600 and will meet all of your needs. They look beautiful, have adequate storage space, and will ship with the sink and faucet sometimes installed so all you need to do is connect the plumbing after you install the vanity. If you love a minimalist design, then you’re going to love this bathroom vanity. It’s made of poplar, so you’ve got a solid construction, even if there is a birch veneer to give the vanity a warmer look. It has a single door cabinet with a large frosted glass insert that provides a dramatic look which will definitely catch your eye! The sink basin and faucet are sold separately, but at just 24 inches wide, you’ll find that this vanity can fit into some snug spaces and still give you a long-term solution for your bathroom needs. What makes this one of the best bathroom vanities around today? It’s modern styling is the first thing you’ll notice with this vanity. It doesn’t have a traditional cabinet, opting for a solid oak wood pedestal instead. It connects with all standard US plumbing fixtures, however, so you’ll get everything you need. 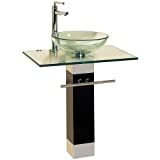 The faucet, drain, sink, glass top, and even the trap are all included and the plumbing can be hidden in the pedestal. A towel holder underneath the glass top gives you the final touch your bathroom might need. If your preference tends to be more traditional than modern, then this contemporary upgrade might just be the best vanity for you. It offers cabinet that will give your bathroom an old-fashioned, elegant look immediately upon its installation. The marble counter top is in a complimentary brown and the undermount design of the porcelain basin will give you a seamless look. You’ll need to purchase the faucets separately and the single door design of the cabinet will give you fast access to your plumbing. This vanity is a great value purchase! If you’re looking for an awesome eye catching vanity for your bathroom, then this is the best bathroom vanity. It features an onyx counter that has a beautiful honey accent and offsets the dark brown finish of the cabinetry perfectly. It’s 48 inches wide, so you’ll need some wall space, but there is only one raised basin that is extra large to use. The basin is a glass bowl that has a faux wood pattern incorporated with it and the end result means ample storage space for your room that is highly durable. If you’re looking for traditional style for your bathroom vanity, then you’ve found the best bathroom vanity with this particular model. It has the compact square design that is so traditional in homes today with a three drawer design. The cabinet underneath has a double door access and the integrated sink and counter combination is made of ceramic. It has the slow drawers that won’t slam on you and will give you a clean, modern look without much effort at all. Make sure you’ve got some shims on hand to make sure you get the installation nice and solid. Are you ready to install the best bathroom vanity in your bathroom today? Use this information to select the best vanity to meet the needs of your home and you’ll have the stylish, upgraded look you’ve always wanted for a surprisingly good price! The best prices on bathroom vanities and our comprehensive reviews are a wonderful relationship to help your shopping needs. Get started today and you’ll be able to find the perfect vanity at the perfect price!